This year's Budget contained little mention of the all-important digital economy, despite Gordon Brown's speech on the industry earlier in the week. Four government departments say they will save £500m a year on IT through a range of measures. Royal Bank of Scotland and Lloyds TSB must increase lending to small business from £38bn last year to £94bn this year. Another 15% of public sector contracts worth £15bn must be awarded to small businesses. Reduction in business rates for one year, leading to 345,000 companies paying nothing and one million seeing reductions. Tax receipts better than expected. Entrepreneurs' relief for capital gains tax doubled, and no increase in main rate of capital gains tax. £270m extra funding as a one-off payment for universities to provide extra places in 2011 and make savings. New central body will oversee and co-ordinate the £4bn worth of government funding available for small businesses to make funding easier to find. There was good news for computer games companies in the shape of planned tax breaks, and a raft of measures to help smaller businesses. But despite recent studies showing the technical sectors will become the most UK's most economically significant in the coming years, there was no investment or tax breaks aimed at the industry as a whole. The sector still found parts of Alastair Darling's speech to be positive about, with tax breaks for computer games seen as overdue. Barry Murphy, UK technology leader at Price WaterhouseCoopers, said the measures need more clarity around them. "The games industry has long argued for support to stem the drift of talent and jobs from the UK. Just how much support is in the rules we still need to see, but if modelled on the film industry's tax relief rules there is at least a well understood base to work from," he said. Small businesses were a real focus for Darling, after a couple of difficult years of being hit hard by the recession. He said he recognised the "role government can play in creating a launch pad for businesses to succeed", and announced measures to help smaller organisations. While some questions have been raised over the short-term nature of the tax breaks and investments, Kate Craig-Wood, CEO of hosting company Memset, welcomed some of the initiatives. "I welcome the plans to make Lloyds and Royal Bank of Scotland lend more to small businesses. Despite a healthy, profitable and growing business, we have not been able to get borrowing from any banks without providing director's guarantees. We need banks to be willing to share at least a tiny portion of the risk." The Forum of Private Business also welcomed the measures, saying, "While critical over some aspects of the Budget - and deeply concerned over its lack of long-term strategy - we believe some of the measures announced will directly benefit smaller firms across the UK." But plans for 15% more public sector contracts to be awarded to small businesses were met with cynicism. Martin Rice, CEO at technology company Erudine, dismissed the targets as "pre-election rhetoric". He said, "Few small businesses can afford the huge cost of engaging with the vast machinery of government procurement. The supply chain is managed by prime contractors and at present SMEs are held back and squeezed by larger companies in the chain. "This new target will do nothing to bring innovation into government from the SME community or improve supply chain professionalism. Unless major obstacles are removed, it would appear talk of embracing innovation is simply pre-election rhetoric." 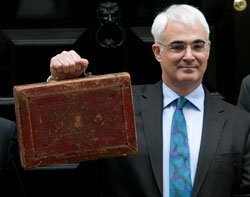 Darling also announced a one-off payment to help universities recruit 20,000 students into science, technology and mathematics courses, and extended its Backing Young Britain initiative until March 2012. The scheme provides funding to companies willing to offer apprenticeships to young people, and global IT trade association CompTIA said this is a good opportunity for IT firms. European vice-president Matthew Poyiadgi said, "Companies willing to offer jobs and experience will have access to advice and financial support. This represents an excellent opportunity for the IT industry, which is struggling to attract young people." Broadband was only mentioned briefly to confirm the government's plans to roll out high-speed internet access to 90% of the population by 2017, funded by a 50p tax on landlines. There was no mention of a minimum speed, and a tacit retreat over Brown's comments earlier this week that 100% of the country would have access to the service. The issue is still controversial, with many arguing the policy to extend broadband access is at odds with policies in the Digital Economy Bill to cut off internet access to people who download files illegally. Jim Killock, executive director of the Open Rights Group, said, ""Darling cannot claim he wants everyone connected to the internet and then legislate to disconnection as a punishment for copyright infringement."